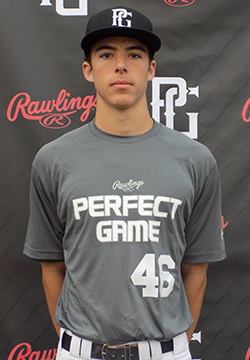 George Davis is a 2019 SS/RHP/2B with a 6-0 150 lb. frame from Bradenton, FL who attends Lakewood Ranch. Medium frame with slender, athletic build; ran 60 yard dash in 7.15 seconds. Hits from open-based stance with deep hand load, short stride with minimal weight transfer, short to ball with line drive plane, good barrel skills overall, looseness to hands through zone, showed ability to work to all fields. Worked out in the infield, solid footwork to ball, flashed ability to field cleanly, clocked up to 77 mph across the diamond. Also pitched, arm works well with clean circle through back up to overtop slot, uses lower half well through delivery, fastball worked 75-78 mph with good plane to plate. Curveball in mid-60's with tight spin and late break, threw both pitches for strikes. Very good student.